A quiet oasis in the heart of the city. 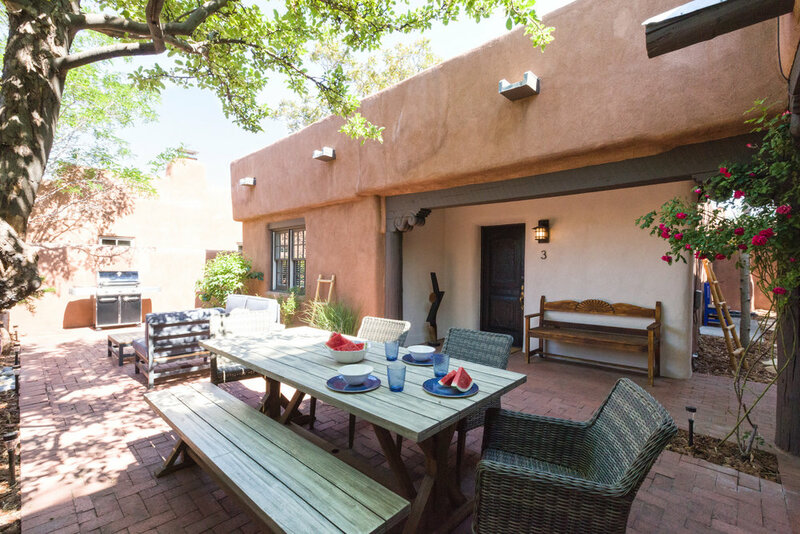 Casetta Verdi is a romantic, serene, bungalow with New Mexico architecture, Santa Fe art and details, and a deep night sky bedroom and star-gazing skylight. A 1 bed/1 bath 'casetta' (little house) that can easily accommodate up to 4 people. The separate bedroom includes a Queen size bed, and the Full size tempurpedic sleeper sofa opens out with no creases, bars, or springs, so that all guests will sleep equally well! We provide high grade Supima cotton bedlinens and hotel grade towels, a laundry room on-site with detergents included, plenty of storage options, and Satellite TV and Bluetooth speaker/radio to stream music from any device. 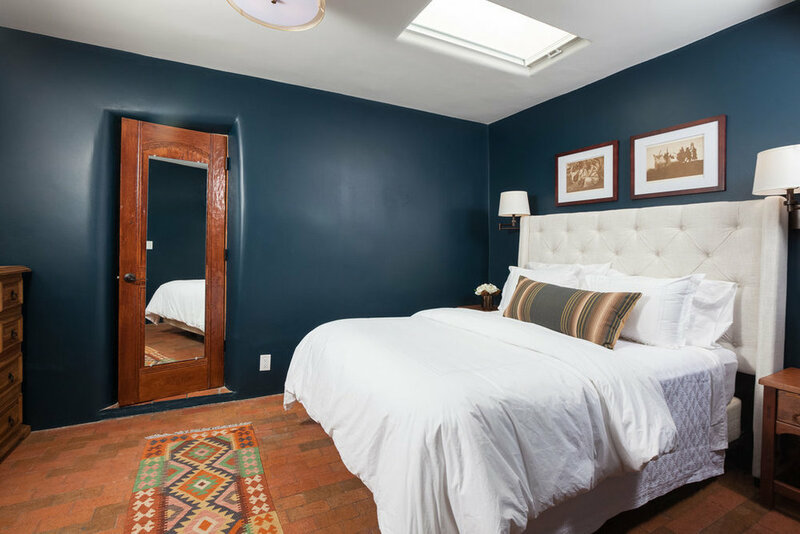 The newly remodeled modern bathroom with rainfall shower and radiant floor heat balances the historic adobe architecture with modern comfort. An open concept design, large kitchen island, and fully equipped kitchen, you'll enjoy not having to eat out every meal, and can seat 4 inside for games or meals, —or during warm days, — you'll love to grill and dine at the picnic table in the gated, enclosed patio right outside your door. 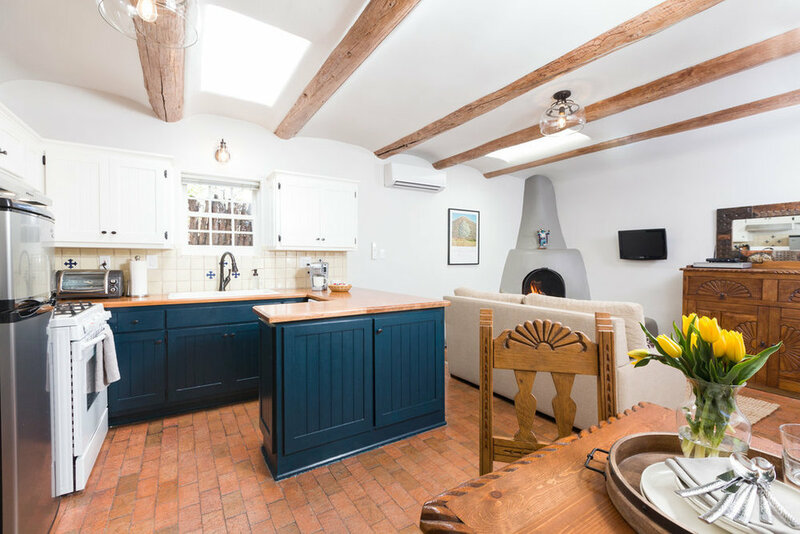 Casetta Verdi feels spacious and inviting, —with a traditional 'kiva' fireplace, skylights throughout, and radiant floor heat, we've designed the 680 sq. ft. with ease of movement in mind, to feel both cozy and spacious, and have provided everything you need and nothing you don't! 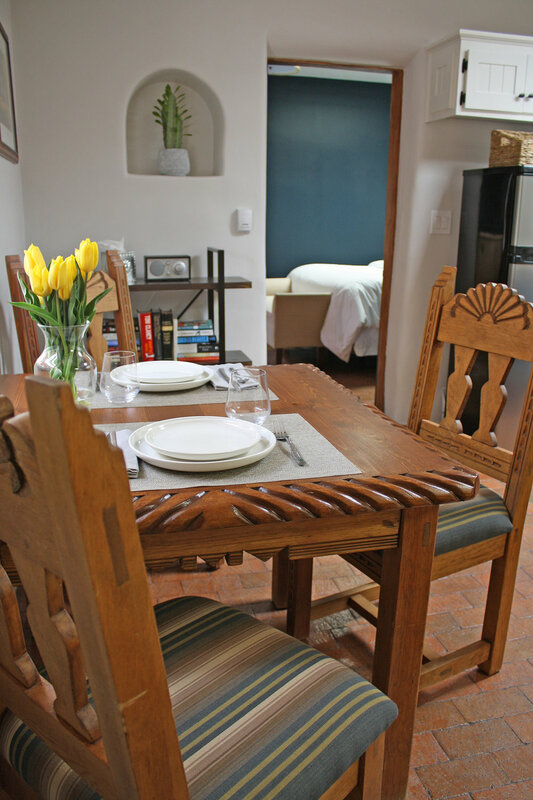 We are located down a quiet residential street, right in the heart of Santa Fe, and within 5-20 minutes walking to all the downtown districts for shopping and dining. See our recommendations under "ATTRACTIONS". *Please visit our rental listings at AirBnB and VRBO for current rates. 15% discounts offered to Santa Fe Opera season ticket holders 2018 & 2019. Welcome to Casa Peña Serena! “Beautifully updated with everything you need for your stay. Super clean, quiet, and comfortable. The outdoor space is wonderful too." Gorgeous, clean, serene and happy. Glorious space, Close to downtown. "Tiny space, beautifully designed. Real care and expertise put into making this tiny space extremely comfortable for two people. Everything we needed, nothing we didn’t. The bed was comfortable, the sheets were luxurious, the bathroom tiny, but well-laid out and much more comfortable than larger rooms with less thought put into the design. The center courtyard was beautifully designed and though shared with two other units, functioned as an extended living room/dining room. The walls are thick, and our space was silent. No street noise, no voices waking us up in the middle of the night. Everything was very clean and in good repair. The level of communication was perfect - and gracious and accommodating. Rick gave us a history of the area, and Heather couldn’t have been more responsive. The owners seem to truly care about their guests’ experience-they left us a lovely bottle of wine as a welcome gift. 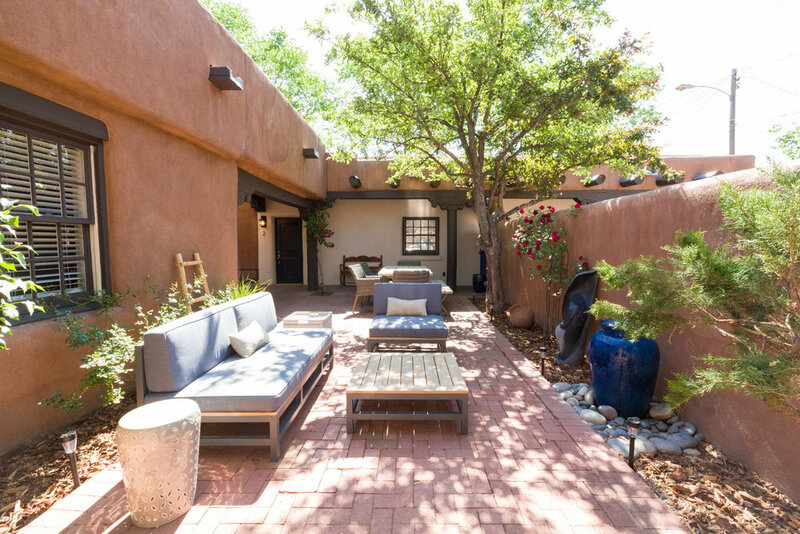 This is the perfect place to stay for a weeklong vacation dedicated to hiking, sightseeing and exploring the Santa Fe food and art scene. Much thanks to the team who made our stay perfect in every way. We hope to be here next year." “I spent a few nights in Casetta Verdi and just adore the colors! Sleeping in an adobe house with the deep blue walls in the bedroom was such a feeling of security and calm. Love the skylights bathing the rooms in light throughout the day, and the place also feels private and cozy somehow. The modern rainfall shower was amazing and made the small bathroom feel spacious, and we loved the warm brick floors on the cold winter nights. The enclosed courtyard, despite it being chilly out, was a sunny enclave to read and have coffee. It was a delightful stay.